That’s a question we hear often. With kindergarten information meetings scheduled and registration for public school programs beginning, many parents of eligible children are thinking about their options, and trying to imagine how their children might fare. There are also families with children who are not “age eligible” for kindergarten. These families may be considering preschool options with the thought that their children might be ready for something different. In both situations, a transitional kindergarten program can serve as a bridge and offer children the gift of time to develop socially, emotionally, physically or academically. 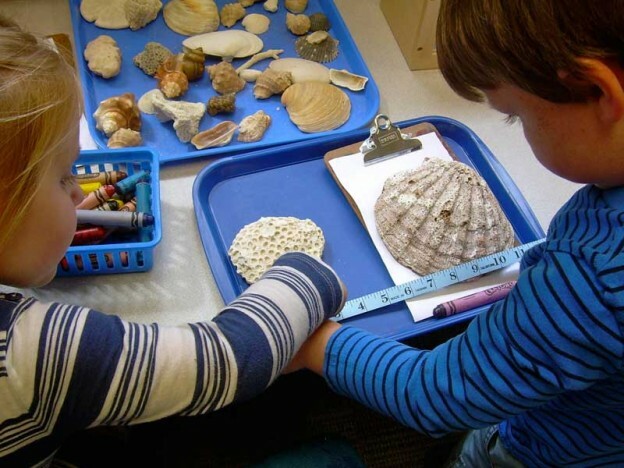 At the Learning Circle, the curriculum is geared to meet the developmental needs of five year olds, but is adapted to meet the unique and individual needs of each child as they grow. Children are challenged in those areas in which they need challenge, and supported in those areas of development in which they are less secure. Class size is small to assure individual attention, and the setting is warm, flexible and nurturing. There are projects and other experiences that support skill development and challenge children academically, as well as extended time for creative use of open-ended materials and play. Having this extra year to grow can make a tremendous difference to children’s confidence in their ability to learn and express themselves fully in a school setting. A transitional kindergarten program can serve as a bridge and offer children the gift of time to develop socially, emotionally, physically or academically. Age eligibility for kindergarten may also be worth thinking about well before your child is five. If you have a younger child who will miss the age requirements for kindergarten when the time comes, you may see your almost three year old as ready to start preschool, but may worry about the prospect of three preschool years before kindergarten. If this is the case, consider asking questions about the ways each prospective program you visit can individualize curriculum so that your child is both supported and challenged at each point of their development. Considering these issues early can help reduce the number of transitions in your child’s early school experiences. The Goldfinch class at the Learning Circle accepts older pre-k children who are not yet eligible for a public school kindergarten but who may benefit developmentally from a transitional class, as well as children who will make the transition to first grade in the following year. It is taught by Barbara Lapal, a certified, nurturing teacher who has taught in both public and private school settings at the pre-k and kindergarten level, and Anne Regnier, an experienced teacher of primary-age children with expertise in teaching, reading and literacy and with a background as a Responsive Classroom consulting teacher for the public schools. The program is highly individualized, the schedule is flexible, and the class can accommodate families that prefer an all day option (8:30-2:45 or longer on four days, with a half day on Friday), as well as those looking for half day and/or kindergarten enrichment options. Extended program options for any child at Learning Circle Preschool can be arranged between 8 a.m. and 4:30 p.m.
For more information about the benefits of transitional kindergartens, we invite you to tour our school and speak directly with our teachers. This entry was posted in Curriculum, Development, Education, Goldfinch, Programming and tagged curriculum, development, education, goldfinch, kindergarten on January 2, 2015 by Katrina Selawsky. “I’ll get the soap for you” says a slightly taller child to a shorter one who couldn’t get the right angle on the soap dispenser. At this time of year, teachers observe more and more spontaneous acts of kindness occurring in the classrooms. The children have had a few months in which to share experiences, get to know each other, and join community building activities and discussions with teachers. We see genuine caring expressed when a friend misses school, and children wonder together whether or not that friend is sick and if they will be returning soon. There are spontaneous gifts made and delivered to friends, spontaneous taking on of “helping” roles in the classroom, without prompting from teachers. It’s wonderful when we can begin to see our intentional support of the children’s sense of connection and community bearing fruit. As we strengthen our own relationships with children, we are always aware that our most powerful teaching opportunities come through the model of our own interactions in the classroom. When teachers model kindness, respectful listening, forgiveness, and caring, children join. We are also intentional about the ways our curriculum approaches can encourage children to appreciate diverse perspectives and learn to work together. This starts with simple activities that require working together or help from a friend. 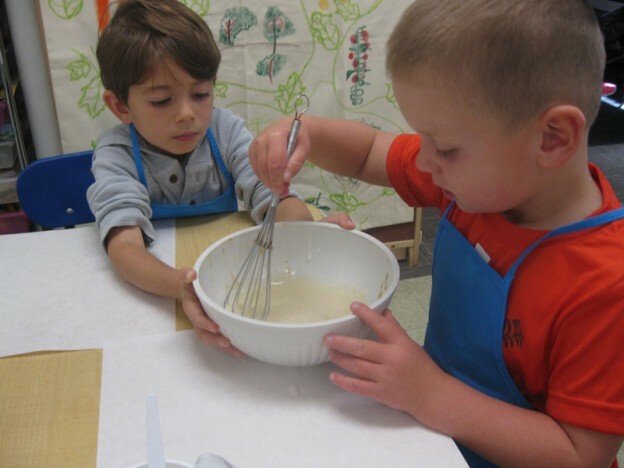 For example, in a cooking project it helps to have someone hold the bowl for you when you stir. Each small contribution of an ingredient is a necessary addition to a finished product that we can all enjoy together – an everyday example of a whole bigger and better than each of it’s parts. We make sure that there are many opportunities for children to collaborate on their work. A large box is much easier to paint with more than one child painting, and then it is available to everyone to use together. A long string can be laced from both ends. Floor puzzles may to be complicated for one, and exciting to complete with help. All these experiences support the notion that it is worthwhile to work with other people. There are many classroom jobs that children can help each other with. Everyone is asked to write their name on a paper, but if a friend is willing to help with some tricky letters, children can learn from each other. We all must figure out how to file our papers or put our wet paintings on the drying rack, but sometimes a person appreciates a little help, and that help often comes from other children. Once the environment has “set the stage” for children to see themselves as potential helpers, teachers make sure that helping and caring behavior is appreciated and recognized. Whether it’s as formal as a kindness bell system, where someone can ring a bell if they notice an act of kindness, or as spontaneous as a genuine thank you when a child sees a need and takes a kind action, we appreciate these successes and encourage all the children to appreciate them too. This entry was posted in Chickadees, Curriculum, Education, Goldfinch, Nuthatch and tagged chickadee, children, curriculum, education, feelings, goldfinch, learning, nuthatch, preschool, social studies on December 13, 2014 by Katrina Selawsky. We recently decided to continue our map project by asking the children a basic question: “What is a map”? 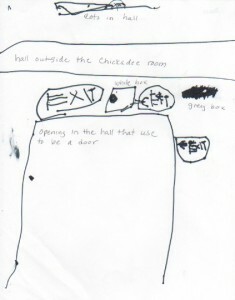 We hadn’t worked directly with maps for a while, though children often stopped to talk about some our previous work by looking at the hallway documentation of our processes. We thought many children would be interested in continuing the conversation, and we wanted to include children who had not had a chance to directly participate before. 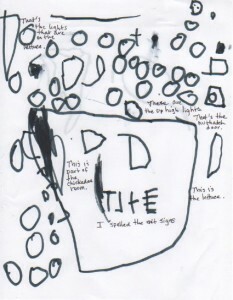 It turns out that many children were eager to share their ideas about what maps are. In reading through the list of ideas, you’ll notice quite a range of ideas, and that led to a rich discussion. Are humans the only animals that map? Is it true that all maps must be carried? How could a map be made using wood? 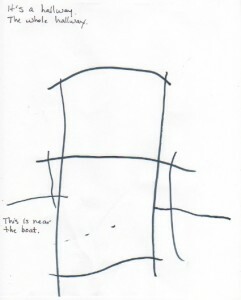 If I can use my brain to imagine, and then describe, how to get to my house, is that a kind of map or not? Our next step as teachers will be to share our perspectives about the information we now have about the children’s thinking, so that we can choose some next steps together. We asked all the children the same question: What is a Map? • A map is the things you remember of your home and you can follow it. • If you don’t know where to go you have to make a map. • You might want to take a trip and you might get lost. • You need a map to know where to go and to be safe from danger. • You use a map if you don’t know where to go. • It’s like the mother and baby owl story…She doesn’t need a map in the woods. She used her big eyes to see in the dark. • Your brain is a map that is part of your body. Your brain can remember. • A map is a piece of paper. It rolls up. It can be cardboard or wood. You have to be able to take it with you. • Mice can’t follow maps. • Pretend animals might use maps. • A map is a thing that leads you all around the world. • A map is a thing that tells you where to go. • Some maps can talk. On phones phone maps can tell you where to go. Like Siri. • You use a map when you don’t know where to go. • All maps show you where to go. • You’d look at a map. • You just draw a map. • You use a map to have it lead you somewhere. • Like to treasure chests – to find gold or silver inside. • You walk and you look where you go on the map and the map tells you where to go. This entry was posted in Chickadees, Curriculum, Education, Goldfinch, Nuthatch, Project and tagged chickadee, children, curriculum, education, goldfinch, nuthatch, preschool, project, social studies on December 7, 2014 by Katrina Selawsky. At Learning Circle, we’ve been thinking about the beginning of the holiday season from the children’s perspective, and offering concrete ways for the children to participate, plan, and celebrate together. At school, holiday celebrations and preparations are intentionally kept low-key and are guided by the interests and needs of individual children. As children informally share their own family traditions at class meeting or other discussions, they begin to appreciate the diverse ways families celebrate. Teachers listen carefully and offer opportunities for children to prepare for the holidays in ways meaningful to them – making a gift or card, talking about a trip or family visit with friends, sharing special foods, singing songs, or dancing together. 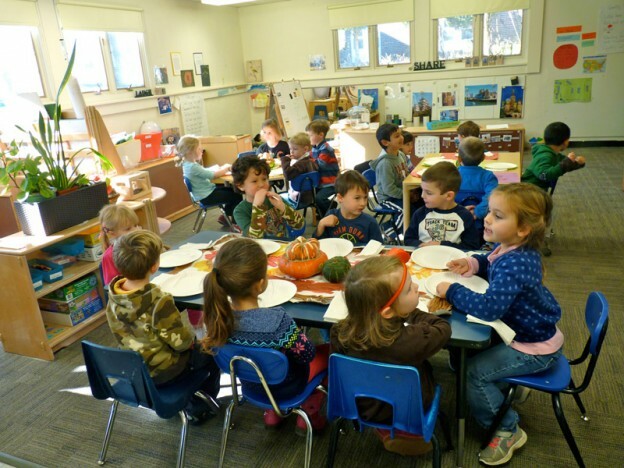 Every year the children enjoy a school-wide Thanksgiving feast. We bring in conversations and activities about “long ago”, a time when people needed to find, grow and prepare their own food, to build their own shelters to keep warm as the seasons changed. We talk about many of the things we have to be thankful for – families that care for and love us, enough food to eat, houses to live in, heat to keep us warm in the winter, enough clothing for each season, and good friends. Each class prepares gifts for a school wide “give-away”. Based on Native American traditions, the give away is an opportunity for children to fill baskets with hand made gifts. At our Thanksgiving feast, each child will choose one gift from each classroom basket. This year we are painting beautiful seashells, making bookmarks, and stringing beads to give as gifts. Each class also cooks for the feast. This year’s menu includes pasta with fresh garlic and tomato sauce, green beans, and fruit salad. At home, we know that along with the happy expectation of a holiday gathering with family and friends, come changes in our usual routine and often some pressure to meet deadlines. As the holidays draw closer, changes may include increased shopping trips, more time spent in the kitchen selecting and preparing a specially selected recipe, possibly re-arranging furniture to accommodate guests. There may be purchasing or getting holiday clothing ready for the holidays or packing and planning for an anticipated trip. Children are affected by these changes. For young children especially, consistency of routine and an understanding of what’s happening next can be an important foundation in their sense of security. When young children notice changes in routine they may feel anxious or insecure. They may exhibit negative behavior, acting out or seeking attention, as a signal that they need some help with these feelings. It’s important for parents to find ways to help children feel involved in holiday preparations. This involvement helps alleviate potential stress or insecurity, and helps to assure that the holidays offer opportunities for young children to grow and feel connected to extended family and family traditions. If you will be traveling, talk with your child about family plans. Allow children to make some choices about what to take, and remember favorite items. This helps children with the transition of getting ready. 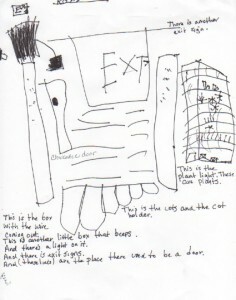 If the trip includes visits to family, children can be encouraged to bring something meaningful to them as gifts, such as drawings or paintings. If you are planning a gathering at home, it is helpful to involve children in planning and preparations for the day. Children can contribute to decisions about what to wear, may be able to help decide seat placement at the table, or may help prepare a simple recipe, such as cutting fruit or preparing a salad. Adults might also want to avoid the pull towards the commercialism of the holidays by choosing toys and gifts that support play. Good toys for young children are open-ended; they can be used in a variety of ways. They offer play value over time; as children change and grow new ideas can be realized. They are well made, and will last over time, even with hard and varied use. They are not tied to TV programs, movies, or other media, so that play ideas come from each child’s imagination and not from an external source. For more information and a wide variety of articles and resources on the impact media has on young children, try www.commercialfreechildhood.org, the website of the Campaign for a Commercial Free Childhood. This entry was posted in Celebrations, Chickadees, Curriculum, Education, Goldfinch, Nuthatch, Programming and tagged chickadee, children, curriculum, Early Sprouts, education, Food, goldfinch, learning, nuthatch, preschool, social studies on November 22, 2014 by Katrina Selawsky. We teachers have been talking with parents about how important it is, right at the beginning of the school year, to establish a strong sense of community among the children and teachers. It’s essential for creating the kind of environment where children feel safe and connected socially. We do this in part by talking together with the children about families, sharing photos, thinking about our samenesses and differences, remembering our experiences from previous school years together, and re-connecting with old classmates who may now be our “neighbors” in another class. This year, children expressed an interest in maps and we saw an opportunity to connect children to the school environment and to help form a cohesive whole-school community. Our map-making project began early in the year spontaneously from conversations in the Goldfinch class. To extend the children’s interest, Anne and Barbara looked at a variety of maps with the children and read a wonderful big book called “Me on the Map” that featured a child thinking about maps of her room, house, street, larger community, out to the whole earth. 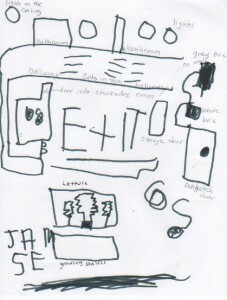 This led to a class decision to make a map of the school playground. checked their ideas by taking the map outside to see if everything was in the right spot. After making some adjustments the children added the grass, the paved bike path, the woodchips and other details to the map. This first step in the project finished, teachers noticed that the children were interested in doing more with maps. 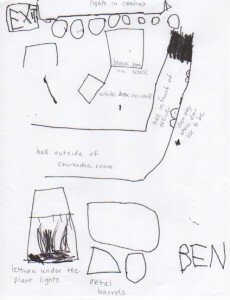 Some children extended the project by making pirate maps, maps of their bedroom and maps of the inside of our school. 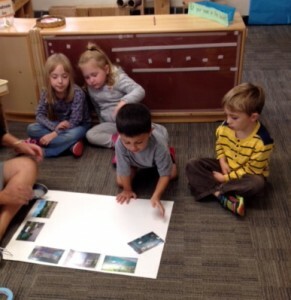 A Goldfinch child who starts his day in the Chickadee class early morning program shared his mapmaking interest with children in the Chickadee class. Before long, there were some interesting new maps that now had details important to children in the Chickadee class too! 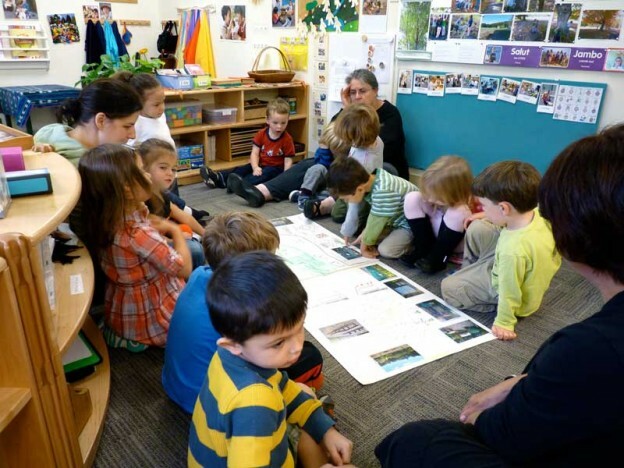 When Stacey, Katrina, Anne, and Barbara talked about the children’s map-making interests at a planning meeting, it became clear that the project could be extended across two classrooms. We wondered about how Chickadees and Goldfinch could work together on maps. Would the children make individual maps or work together? Would they continue to map certain parts of the school and then put them together? Develop working relationships through map-making by focusing on common interests? Explore the school environment as a whole (inside and outside) though map-making? Simply meet occasionally to share their work and interests? We decided to reserve judgment. We’d begin by asking the Goldfinch children to come in the Chickadee classroom, talk about the maps they had made and present their work. After a great discussion, it became clear that children from both classes wanted to continue to map our school. 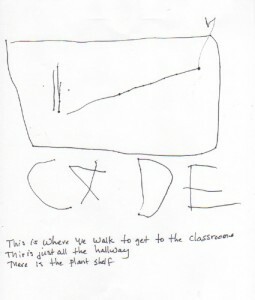 They decided that a good next step would be to map the hallway outside the Chickadee classroom, where lettuce and other plants are growing under grow lights. Children volunteered to join small groups, deciding each child should each make his or her own map after walking the hallway together. We were ready for the next step. But it turned out that we didn’t work in small groups. 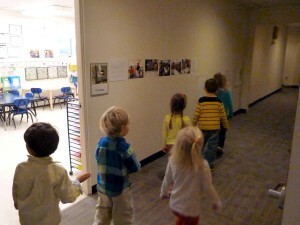 Instead, the Chickadee and Goldfinch classes walked through the hallway together to investigate details that would need to be included on the maps, and set to work on individual maps. Some children from the Nuthatch class joined in. The results of the children’s work are hanging on the wall outside the Chickadee classroom. We expect that after children take some time to look over the diverse approaches to map-making on display there, we’ll be adding more steps to this on-going project. 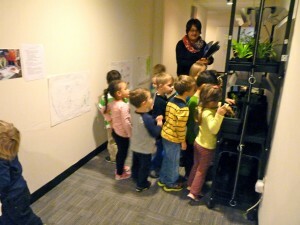 What started as an interest among two or three children grew into a project involving children from three classrooms. Teachers listened carefully and recognized the children’s knowledge about and interests in maps. Teachers then worked out an approach to a map-making project that came to include all interested children in a developing process of exploring our environment and marking down the things most important to them. For some children, it’s the people that are important to include in a map of the school. For others, it’s the shape of the building, including ceiling height and roof shape that matter. 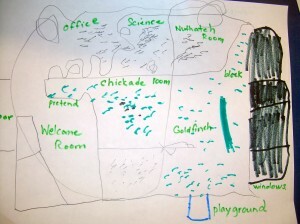 One child mapped our view of the Great Blue Hill with its trails, bird’s nests, and natural features. Many children were interested in finding all the exit signs, fire extinguishers, and doorways that are part of our school. 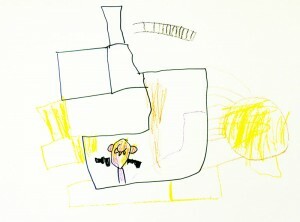 As each child views other children’s work, everyone’s experience with map-making will be enriched. With the opportunity to talk about all these diverse approaches, all the children will have a concrete experience together that reinforces our connections to each other across a whole school community. There is a path that gos to the big rock. It starts at the tree and goes past the bat house up the walkway to the top of Blue Hill. There are many different paths to get to the top. Some are short and some are long. There is an eagle that lives at the pointy top. 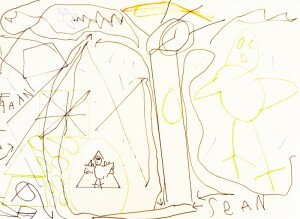 There are 7 trails on Sean’s map. My house has a window. It has a roof that is pointed. My house is shaped like a rectangle. Next to my house there is a shed. It has 2 doors and 1 lock that holds the doors together. It has 2 windows on the side. The stairs on the side of my house go in front of the shed. It has a curvy roof. My house is between my house and the shed. 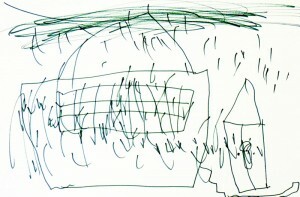 Map-making lets children use drawing to reflect their knowledge and current thinking about their immediate environment. It helps children take the time to notice details that are important in that environment, especially the important landmarks that help define our relationship to the space we share. 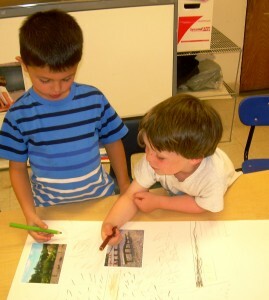 Map-making helps children see their environment from diverse perspectives. 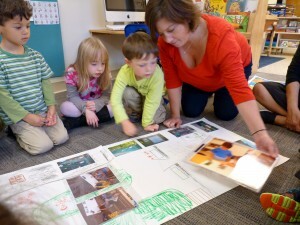 When working on maps collaboratively, children begin to realize that each person’s vision of and relationship to their environment is unique. It helps children think about and experience space and spatial relationships in a concrete and meaningful way. What happens next? The choices children make about their “next steps” in a map-making process will guide us. We may find that mapping the home environment (bedrooms or neighborhoods) offers the children ways to share more about their family lives. We may continue to map our school, and find other connections to the common spaces we share. Whatever develops, we teachers will be listening! 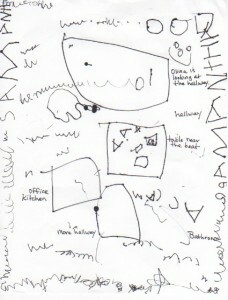 Has your child made any maps at home? Please share your mapping stories – it will help us know how to continue this project! This entry was posted in Chickadees, Curriculum, Goldfinch, Nuthatch, Project and tagged chickadee, curriculum, education, goldfinch, math, nuthatch, project, social studies on November 16, 2014 by Katrina Selawsky.